I'm in Istanbul, but my bicycle isn't… Lufthanza lost it. 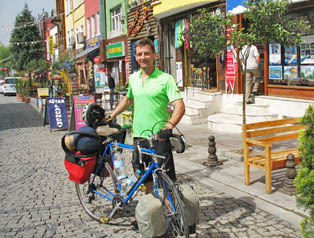 I'm still in Istanbul, and my bicycle isn't. 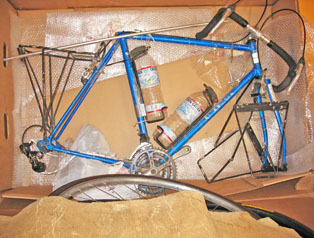 But this evening I get word that the bicycle will arrive Monday morning. I have the bicycle. It arrived around 8:30 this morning. 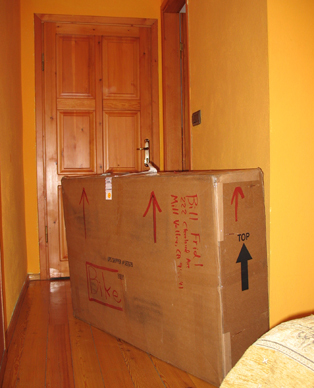 I assemble it, check out of the hotel, and ride the few kilometers to the ferry port, arriving there around 10 am. Unfortunately, the next ferry to Yalova is 1:30 pm. Oh well. When the boarding call is finally announced, I hop on the bike, cruise pass the swarm of people shuffling toward the boat, chain-up the bicycle on the car deck, and take two of the panniers with me up to my assigned seat. Unfortunately, the nicely dressed young man in the seat right beside me has a serious body odor problem. I spend the next two and a half hours wandering around the ferry trying to find a corner where I can stand and read. The ferry arrives around 2:40 pm. No question that the ride is off to a late start. But what a really nice way in and out of a big city like Istanbul. Leaving Yalova, the road is a climb - with lots of oversized trucks riding next to me - but it goes well, so at the first potential hotel stop, Orhangazi, I don't slow down, hanging a left and signing-up for another 49 kilometers to the next possible site of a hotel, Iznik. On my map the route is lakeside and thus must to be flat, but the late hour is stressing me. As I ride along, I keep glancing at my watch, doing the math, convincing myself that I will make it to town by dark. I make it. As I enter town, I pull out my Iznik info - notes taken from Lonely Planet's Turkey volume (with 5 countries on my itinerary, I can only travel with the Middle East volume, which doesn't cover the smaller towns.) and take a left at the traffic circle - looking for the cheap hotel, supposedly with only two rooms and a dorm. Well, the Kaynarca Pansiyon now has 10 rooms and charges 25 Turkish Lira or about $19. That's not a steal, but there are three outgoing French travelers checking in when I arrive, and their dinner invitation seals the hotel selection. I shower (dang - cold!) change into my one non-bicycling outfit, and walk with them down to the lakefront for dinner in one of the fish restaurants. Then back to the hotel for a solid sleep. I'll visit this town again some day. My late arrival plus early exit meant that I didn't see much of it, but with its ancient wall, history (apparently the first seige of the first Crusade) and nice lakefront promenade, it seems worthy of a revisit. Time to leave the comfort of Istanbul's "Backpacker's Row."